Mr. Binns, a University of Florida graduate, has served in various capacities in South Florida governments for 14 years. 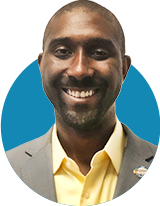 He began his career with the City of Miami as a Legislative and Policy Advisor and has held several positions in the City of Miami and Miami-Dade County governments focused on community and economic development. Mr. Binns served in the Miami-Dade County Mayor’s office where he was responsible for policy, legislative affairs, and special projects for a portfolio including Management and Budget, Procurement, Information Technology, and Human Resources. He has also served as the Interim Manager for one of Miami-Dade County’s municipalities. Basil is currently the Assistant Port Director for PortMiami.